Yes, it’s true that installing wireless access points is often easier than installing them in individual hotel guest rooms, multi-dwelling units (MDUs) including student and military housing, apartments and condominiums, retirement and assisted living residences, and classrooms. Many hallways feature drop ceilings, making cabling and installation a snap. Even when there are finished ceilings present, cabling soffits or access panels are often already in place or are reasonably easy to install, making wiring possible. If low-voltage infrastructure, such as a spare CAT5e/CAT6a cable is not already available in each unit, cabling the units can be impractical or cost-prohibitive. 1. Attenuation: The inside wall adjacent to the hallway tends to have high attenuation. Why? Most hotel guest room’s and MDU’s outside walls are made up of large windows, while the inside walls tend to be where the metal appliances such as refrigerators, dishwashers, and ovens are located. You’ll often also find full wall mirrors, bathroom plumbing, and steel fire doors in hotel guest rooms. All of these obstructions interfere with wireless signal penetration. It is not uncommon to see much better signal penetration through the floor and ceiling than from the hallway into the unit. 2. Self-Interference: A long, thin corridor acts as a tunnel for Wi-Fi signals, focusing the signal and making it extend much further than it will laterally into the units. Even with the access points on different channels, there is always some level of adjacent channel interference. When APs installed in halls are all lined up, they’ll cause interference with each other; the heavier the traffic load, the more interference. 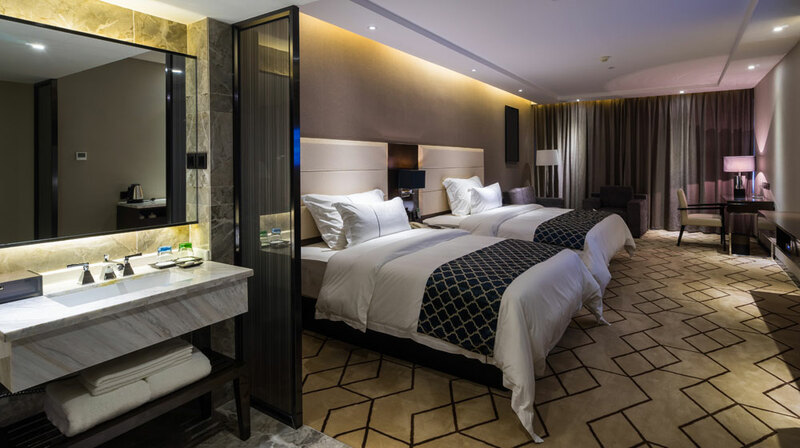 It’s for these reasons that it’s almost always better to install APs in individual hotel guest rooms, apartments, dorm rooms, and classrooms. Except for new builds, you’ll often find pre-wired, low-voltage network wiring is available in hotel guest rooms, dorms, and other multi-tenant dwellings. Pre-existing wiring creates the perfect scenario for using wall plate APs to provide reliable in-room Wi-Fi to guests and residents. Wall Plate APs bypass the performance concerns of placing APs in hallways, bringing the coverage right where users need it most–in the unit itself. EnGenius’ new Neutron 11ac Wave 2 Wall Plate AP (EWS550AP) integrates a high-speed AP and a 3-port Gigabit switch, merging wireless, wired, and Power-over-Ethernet features for in-room connectivity. You can use the wall plate AP’s Gigabit Ethernet ports to connect various wired devices including IPTVs and game consoles in hotel guest rooms or dorms and networked projectors in classrooms. The AP includes a wired pass-through port to connect a room phone to the hotel or school PBX system or connect and power a VoIP phone using the PoE-pass-through LAN port. The wall plate AP is also powered through an 802.3af/at-compliant PoE switch. The onboard switch allows you to segment and manage network traffic by type with its port-based 802.1Q VLAN support. If you don’t have the benefit of existing low-voltage cabling infrastructure, one trick often used is to run the cables down the corridor, penetrate the wall above the doorway into the apartment or guest room, and mount the access point above the door. While it’s ideal to install the access point within the center of the unit, this type of mount is preferred over in-hallway mounting because it gets the AP closer to your user’s client devices. Placing APs just inside the room means signals don’t have to penetrate the wall, plumbing, or other in-room obstacles. It also means those barriers are now working in your favor to protect the wireless signal from other APs. It’s nearly always best to install APs directly in-room or in-unit if at all possible, even if you need to shortcut the cabling above the door. Wireless signals will be much stronger and more user-friendly. Need help designing or planning your Wi-Fi installation in a hotel, MDU, or school? EnGenius offers free system design assistance. Editor’s Note: This updated post was originally published in 2015.